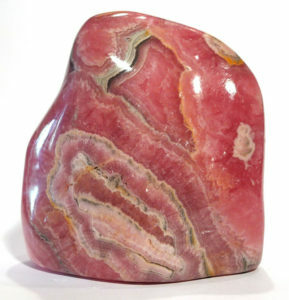 Rhodochrosite is energising and tremendously uplifting. With its bright pink colouration (in its classic colouring), it obviously aligns with the Heart Chakra and represents love. In this case, although working on many levels and in many contexts, the emotional aspect resonates with the feelings we get with the exciting first fluttering of new love, and it can bestow a positive enthusiasm and love for life. 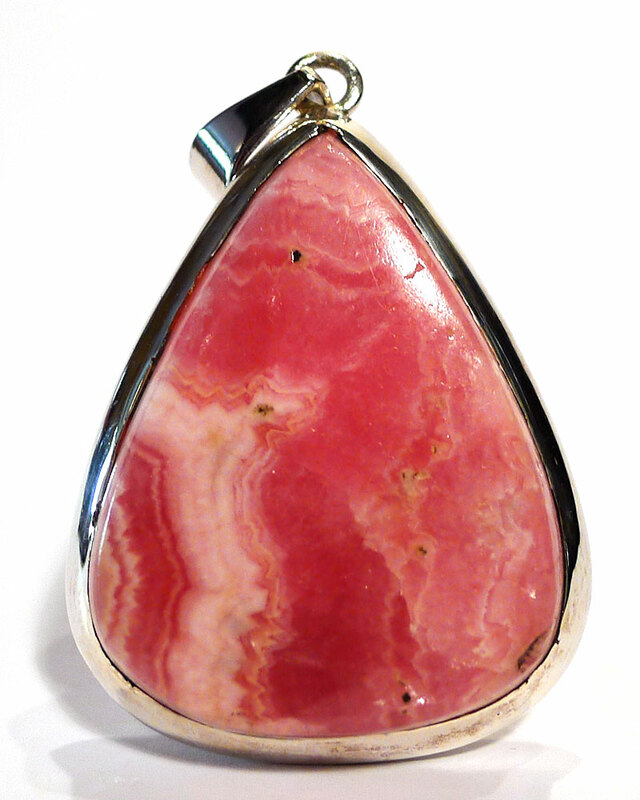 Rhodochrosite can be employed as a general balancer, including balancing male and female energy, and makes an excellent anti-depressant. In common with other carbonates (such as calcite), it can be very clearing, helping us to get rid of the old energies and habits we no longer need, and aiding our recognition of the restrictions and inhibitions we place on ourselves, or have accepted and adopted through upbringing and environment. This recognition in turn allows us to release these old energies and embrace the delights life presents us with. Its energy is gentle but very dynamic, so it can also help to increase the libido. Rhodochrosite forms in hydrothermal veins, high-temperature metamorphic deposits, and as a secondary mineral to sedimentary manganese. Its classic colour is rose pink, although it is also found in brown, grey and white. The lacy stalactitic variety is popular in jewellery and ornamental pieces, the best of which come from Catarnarca, Argentina, and are sometimes called “Inca Rose”. Beautiful crystals come from the Sweet Home Mine in Colorado, USA, which I understand has recently been reopened. In Butte, Montana, USA, rhodochrosite is so common it’s actually mined as manganese ore. In contrast, some of the most beautiful material is becoming mined out, so is very difficult to get hold of – this is especially true of the large stalactitic pieces from Argentina (main illustration).